As CloudFactory expands operations into Kenya I was reminded of the concept of DNA and how it plays such an important role in the formation of life. The challenge of transferring DNA is that outside the species you lose the ability to create. 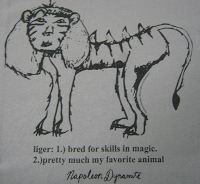 Napoleon Dynamite was a fan of Ligers for their skills and magic. Fortunately we need not worry about the world being overrun with Ligers thanks to the DNA transfer problem. Even if DNA were transferred easily, it takes a lion and a tiger to tango and they are not on the same continents. Tigers dig Asia and Lions roll in Africa. In some odd way or another this is the challenge that we are excited to undertake. How can we transfer the DNA of CloudFactory, an award winning impact sourcing company, from Asia to Africa. CloudFactory was born and raised in Nepal. Like many Asian countries the culture that permeates the land is one of honor. I’m not an anthropologist, but the role of group identity is seen very well in Nepal and it gives our teams of data entry workers a great bond and ability to reach goals together. As we move into Kenya we are bringing many lessons learned in building a scalable workforce that not only excels in data entry but is growing every week in leadership skills and giving back to their communities in unique ways. However, Africa is not Asia. Many African nations operate on a culture that seeks to maximize power rather than honor. The bigger ones get their way and the littles ones stay out of the way. Take a trip around the Nairobi’s infamous traffic jams and you’ll experience this reality for yourself. Even in a new culture, the way that we work is challenging and brings out the best in people. A recent post on our community blog shows that early teams in Kenya are giving their time and treasures back to others and learning as they serve. Despite the cultural differences between Kenya and Nepal, there are exciting new opportunities to explore. Some of the powerful things that make Kenya an ideal market to power our Business Process as a Service (BPaaS) offerings are the penetration of internet, english fluency, and available talent in the labor force. We believe that a commitment to excellence in data related work coupled with the opportunity to grow in leadership and community service is both honoring and powerful. Watch out world! The CloudFactory Liger is getting bigger everyday and ready to take on the jungles of data that are quickly growing in organizations everywhere.